Two women holding hands at the last Reminder Day in 1969. In honor of Gay Pride Month and the 50th anniversary of the first gay rights march, the National Constitution Center and the William Way LGBT Community Center are teaming up for a new exhibit. "Speaking Out for Equality: The Constitution, Gay Rights, and the Supreme Court" opens Friday, June 5. The exhibit will remain open through Monday, September 7 and chronicles the country's long debate over gay rights using artifacts, court cases and personal stories. 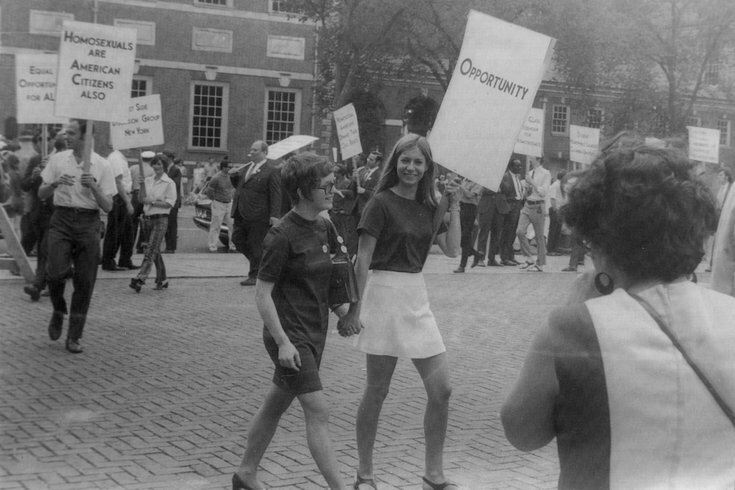 It's all in honor of the 50th anniversary of the Annual Reminder protests, a march for gay rights that was held every July 4 from 1965 to 1969 at Independence Hall. A reenactment of the first Annual Reminder will be held Saturday, July 4. "Speaking Out" starts guests off with images of the Annual Reminder and current LGBT issues in the media before leading them through six exhibition sections. The subjects covered will range from "Being Gay in the Mid-Twentieth Century" to "What Does Equality Mean?" all framed within the U.S. Constitution and the rights it guarantees. This National Constitution Center exhibit is one of many programs celebrating the landmark Annual Reminder demonstrations. William Way has created an online timeline of Philadelphia's history of LGBT rights along with a list of participating anniversary programming.